As the chart makes crystal clear, tax considerations are a crucial part of retirement planning. Federal taxes are not the only taxes to consider. While state income taxes can reduce incomes marginally, retirees should take into account property and sales taxes when determining their total tax bill. In retirement, where you live can greatly affect your personal bottom line. Those deductions and credits for those over 65 don’t apply to retirees who have substantial pension and/or IRA incomes. I just completed my 2015 return and once again I am sending a check to IRS. If you are successful at retirement planning and have 70-80% of your working income as retirement income and have no mortgage, be prepared to pay income taxes. Very informative! This data should further encourage working people to maximize their contributions towards their retirement accounts (401k, IRA). Planning for this starts well before retirement. While we were working we invested, did the typical IRA & 401K, practiced tax avoidance, and did all the things you read about doing. Now, both retired and living off capital gains and tax-free bonds. But, 70-1/2 will be here in a decade – we’ll see what happens to the tax bill when those tax-deferred investments start. Maybe we could/should clarify the Social Security Administration’s quote. 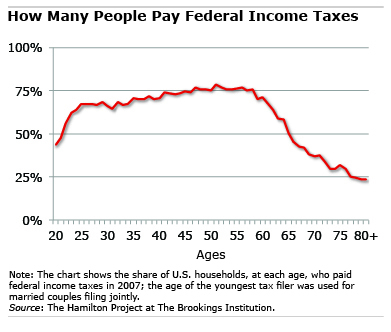 First “Other Taxable Income”: This includes just about ALL pension income and half of your Social Security income. Secondly, “other substantial income… in addition to their benefits”: That other substantial income limit is set at $32,000 (MFJ). Substantial? An amount that has never been adjusted for inflation – ever! By law the taxes collected on Social Security benefits are returned to Social Security which is a less-than-obvious reduction in your calculated benefit. It is not the investments that start; it is the required minimum DISTRIBUTONS. They are calculated by dividing the year-end balances by a divisor from the appropriate IRS table. For most people the divisor at age 71 is 26.5, which means you must take about 3.8% of the balance(s). By age 80 it is 18.7 (about 5.3%) and at 90 it is 11.4 (about 8.8%). So as you get older, a larger share of your tax-deferred account(s) goes to the U.S. Treasury. Any underestimate or neglect is subject to a possible 50% penalty of what was required but not paid. As for Soc. Sec., the threshold amounts of adjusted gross income beyond which up to 50% or 85% are taxable have not been changed for decades, one of the ways Congress increases taxes covertly. I can understand how some people will pay less federal income tax in retirement but for those who saved via a tax-deferred retirement plan reaching the age of required minimum distributions is a rude awakening tax-wise. Its not the RMD itself, its the affect it has making Social Security benefits taxable. I pay more now in Federal income tax than I ever did while I was working. Retirees also don’t pay payroll taxes. In many states, they don’t pay state and local income taxes either. It isn’t just income taxes. Retirees pay lower taxes than workers with lower incomes. And today’s retirees pay lower taxes and get more benefits than tomorrows, as they continue to get all the benefits the promised themselves but were unwilling to pay for when working, when they wanted tax cuts. If you’re concerned about the tax burden from RMDs at 70 1/2, a QLAC (Qualified Longevity Annuity Contract) is a great new planning tool. It allows you to shift up to $125k into an annuity contract from a traditional IRA. Distributions from this ‘bucket’ are deferred until the age of 85. These are thanks to new tax legislation in 2015. Great opportunity for those not wanting as big a RMD as the IRS requires. As far as taxes after 70 1/2, are RMDs required from deferred annuities? How does income from deferred annuities impact Soc Sec benefits? Are there any annuities or other investment vehicles that reduce tax liability and impact on Soc Sec benefits? Having reached the magical age of 70½, I’ve discovered as others have noted that my tax liabilities have increased. 85% of my Social Security benefits are subject to Federal income taxes. They will continue to be taxable until I die. Also, the RMD withdrawals mandated by the IRS ensures that I must pay Federal and state income taxes for as long as I live. In addition, my annual tax liability is and will continue to be greater than when I was employed.